At Home Leisure Direct we offer the largest selection of jukeboxes in the country and always have a selection on display in our Bristol showrooms for you to experience first-hand. 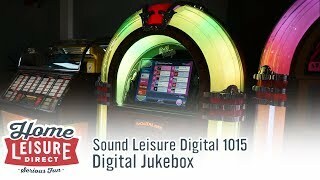 Whether you're looking for a new jukebox, a vintage jukebox, a classic vinyl jukebox, a jukebox from manufacturers such as Sound Leisure, Rock-Ola or Wurlitzer, or an incredible CD jukebox or digital jukebox, we’ll be able to help you find exactly what you want. Our award-winning team have a wealth of expertise on jukeboxes and will be able to advise you on the right machine for you. We love jukeboxes both vintage and brand new, and whether you’re looking to play your classic records from the 40s, 50s and 60s or rock your CDs and mp3s, we’ll get you set up with some of the best-sounding and most beautiful jukeboxes in the world. 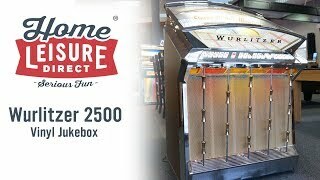 When you buy a jukebox from Home Leisure Direct, we will use all of our experience and passion to give you the best and lowest-priced choices. We have a fantastic selection of new jukeboxes on sale, many of which are on display in our showroom. 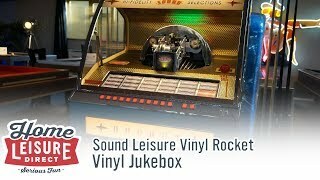 While music players come in a variety of styles and capabilities, there is simply nothing that can emulate both the look and sound of a jukebox. Our new jukeboxes have been crafted to look like classic models and to emulate the rich tone of the originals. Whether you’re looking for a model to play your old records or one that will download the latest chart hits, our range will have you covered. Although brand new jukeboxes come with incredible features and technologies, for many there’s simply nothing better than owning one of the vintage jukeboxes they experienced in diners, pubs and so on back in the day. We keep a stock of the best we can find, cleaning them up and restoring them with love so that they play perfectly. We are passionate about jukeboxes and specialise in vintage models, only selecting the best in quality for their age. We often stock vintage jukeboxes from the late 40s and 50s, which are especially hard to attain in such good condition. 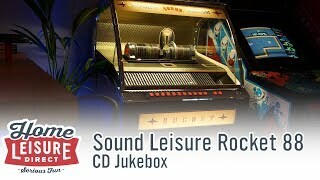 For those of you who built a CD collection instead of vinyl, but love the look and sound of classic jukeboxes, CD jukeboxes are a perfect marriage of the two technologies. These impressive machines are replicated from the most popular models of the silver age and are a stunning addition to any room. Some CD jukeboxes can even be specified to incorporate an iPod dock, allowing you to connect your iPod or iPhone to play your mp3s, or to allow a friend to experience their music on a fantastic 300w amplifier. Vinyl jukeboxes are currently enjoying a revival, due to the rise of popular interest in vintage products and a renewed interest in vinyl records. Whether you’ve already got a collection of vinyl or are just getting into vinyl fanaticism, your records deserve to be played in a beautiful jukebox. We stock both new and vintage vinyl jukeboxes, so if you want the rich tones of the original valve amplifiers or you prefer the latest technology, we can help you find the perfect jukebox for your home or public space. For fans of modern audio systems who still want the retro look and feel, we stock a range of digital jukeboxes. These machines combine the timeless design of a classic jukebox with state-of-the-art technology. Our digital jukeboxes allow you to upload your own music from iTunes or your CD collection, or enable you to subscribe to a pre-loaded selection of thousands of tracks. Digital jukeboxes are a great way to keep all of your music in one place without having to store a huge CD or vinyl collection. Our staff are specialists in our range of jukeboxes and are here to advise on the best jukebox for your needs. Visit our Bristol showroom to experience the models we have in stock to view and try them out for yourself. At Home Leisure Direct we are passionate about music and jukeboxes, and will find the perfect model to suit your needs and bring you the joy that only one of these amazing music players can offer. We believe visiting us will be the most fun showroom visit you will ever have. Whether you’re looking for a classic vintage jukebox, a brand new jukebox for a brand new experience or one of our other fantastic games room products, we look forward to welcoming you soon with a freshly brewed cup of coffee and a truly enjoyable experience. Take our Showroom Tour to see what awaits you. 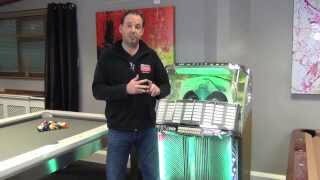 Buying a jukebox can be a real investment, so let us make that easier for you. We offer Buy Now Pay Later and low interest payments (19.9% APR) on most of our machines, with no deposit to pay upfront and flexible payment terms (subject to acceptance). Please see our terms and conditions for more details. We work hard to make sure your jukebox purchase is as stress-free as possible from start to finish, and having our own delivery service takes away a major headache that might occur with other retailers. Our new jukeboxes are collected directly from the manufacturer and transported straight to you, giving us full control over the process and ensuring your machine is treated with the greatest of care before it gets to you. Our refurbished jukeboxes are fully serviced from top to bottom, using original parts where possible and high-quality replacements when necessary, and then transported to you by our expert delivery team.